Model 9100 is a Single-Channel, 2U, half-rack size, bench-top power amplifier designed for signal amplification. With unprecedented signal purity, Model 9100 amplifies signals from dc to over 500 KHz. The unit has a fixed gain of x15 however the same amplifier is available with custom gain and no signal purity or performance degradation whatsoever. 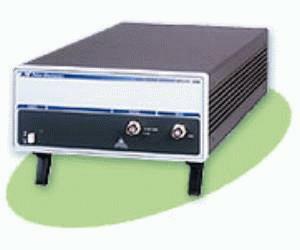 Model 9100 operates as an amplifying buffer for signals emitted from waveform, function, or pulse generators. Most of these generators produce signals limited to 20Vp-p into high impedance. Model 9100 can convert these voltages to levels as high as 300Vp-p. The amplifier has a current driving capability of ±150mA from a 0.1ohm source. While the output can drive small capacitive or inductive loads, for full high speed potential it is recommended that the load characteristics should be mainly resistive. Model 9100 can withstand load capacitance and inductance up to 0.01µF and 0.5 mH without any performance deterioration. The advanced power amplifier is supplied with floating input and output connectors allowing flotation from ground level up to 250Vdc. The only limitation is that both the input and output grounds must connect to the same level. This capability is extremely important in applications where the amplifying device must reside on the same ground level as its source. The floating capability can be added or removed using a simple, user-accessible, jumper connection.